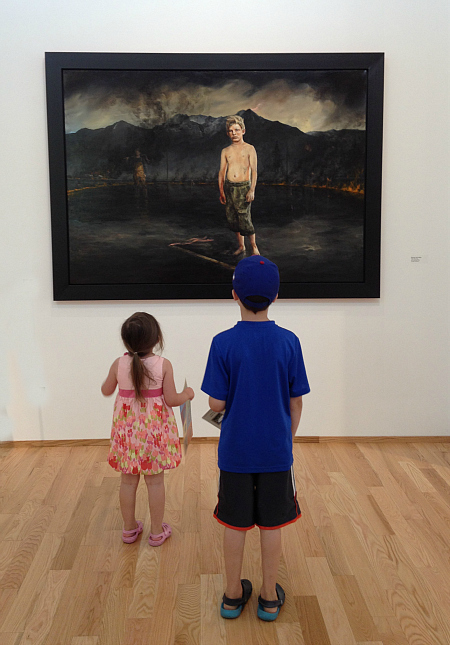 Taking kids to an art museum can be an unpredictable adventure. They might love it, browse the art along with you and beg not to leave. They may also barely scan the art, try to touch everything and use the voice you begged them to only use on the soccer field the whole time. Kids are kids and expecting them to adore things that aren’t completely designed for them and then being angry or disappointed when they act their age is not really fair. 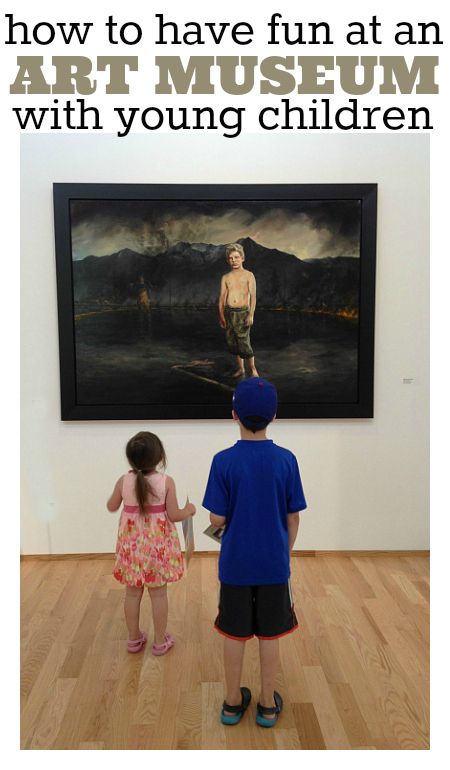 That doesn’t mean that we shouldn’t expose our kids to art at art museums or give them expectations to live up to. What it does mean is that we help them reach these goals by giving them some tools. Here are 5 simple games you can play with your kids at the art museum to keep them engaged in the art . This game was created by my 6 year old on the way to the museum on Friday. I was explaining the next game on our list when he announced from his car seat that he had a better idea. I ran with it. One player chooses a work of art in a room/gallery but does not tell the other players which one it is. The other players try to guess which work of art is the secret one. You can ask for clues that give a yes or no answers just like in the game 20 questions. Whoever finds the secret one first gets to choose the next one in the next room/gallery . I’ll Take That One ! Each player chooses one piece of art in each room/gallery to pretend they are going to buy from the museum. They must also say where they would put the art in their own home. This is essentially a color hunt. In each gallery see if you and your kids can find every color of the rainbow. To make it more challenging you can add a rule that you can only find one color per painting. So that painting with the rainbow … yeah not going to cut it! This is a great game to play with toddlers, just make sure that they know that art is for looking at and not touching ( we are still working on that too ). Choose a color from inside a painting and the players can make guesses to what element it may be. For example if there is a brown dog in a painting the spyer will say ” I spy something brown” and the guessers will look for all the brown items in the painting, hopefully guessing the dog. This works great with kids of similar ability levels. My kids are just getting to the point where they can play games like this together and I love it. With older children you could do this with artists or genres saying ” I spy a Jackson Pollock” or ” I spy an impressionist painting.”. Adapt it to your kids. Go early when there are fewer crowds and your kids are fresh and open to learning. Go on a full belly. Look at the map together and find the bathrooms on the map. Suggest you check them out right away. Go on a free day so if you must abort ship when a meltdown arises you aren’t out an admission price . It can be busier but if your child isn’t the quietest ( I know mine aren’t) the crowds tend to make a loud toddler voice less distracting and make your trip more pleasant. 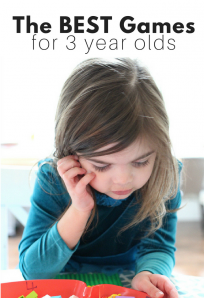 You can talk to your kids in a regular voice and not worry about your kiddo being quiet. Find out if photography is allowed and if it is hand your kids a camera to document their trip. In and out. Most museums will allow you to have in and out privileges so if your kids need a breather take one. Play games to keep kids engaged . 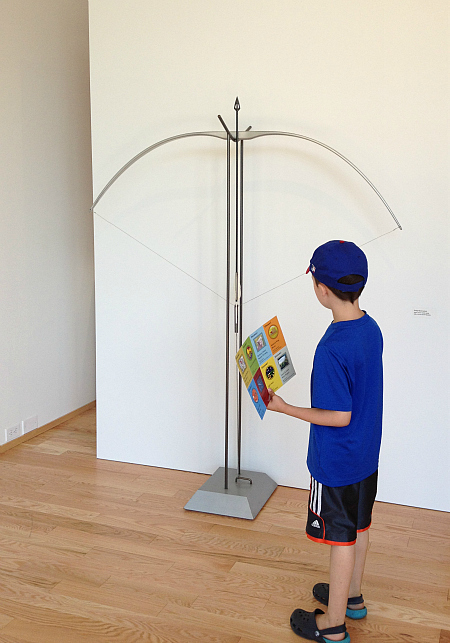 Some museums will have kid friendly maps or guides . Know when they are done and find the nearest exit. Don’t try to see just one more thing. If you see the signs of a meltdown just go. Visit the gift shop and after you return home read about art, museums and artists to keep the learning going. Babar”™s Museum of Art by Laurent de Brunhoff is one of my favorite art books for kids. My son has recently decided he hates it because he doesn”™t want to see the elephant versions of the art. All the art in the museum are masterpieces that you will recognize redone with elephants. He slams the page in the way only toddlers with a definite sense of justice can and says ” No elephant paintings Mama, real ones!” Trust me though this book is awesome and he loved it a few months ago. The story is about how Queen Celeste wants to change the abandoned railway station into a museum to house all their collected art . The museum itself looks just like the Musee D”™Orsay in Paris and the story also explains art for children. 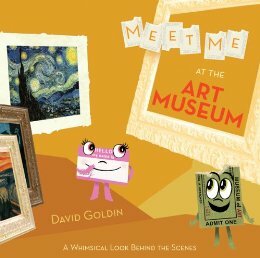 Meet Me at the Art Museum: A Whimsical Look Behind the Scenes by Davis Goldin was a gift shop find at the museum we visited last week and the perfect book to keep my kids learning and interested. I read it to them while they ate lunch after our morning visit and they both really liked it. The book is a behind the scenes tour of an art museum. My daughter liked the inanimate objects that were turned into characters like the ticket stub and name tag while my son loved the insider info like how they choose paintings to display , check to make sure they aren’t fakes, and the security devices they use. I loved how it really explained the different jobs at the museum from docent to archivist to director and curator. The book held both their attention and reading it right after out trip gave us a fresh experience to relate it to. Museum Trip by Barbara Lehman is fantastic. This wordless book has a clear strong message ”“ that if exposed children can loose themselves in art, it opens a new world with new adventures before unseen! The story opens with a little boy on a school field trip to a museum, he looses his group , and soon finds himself in the art. After completing many mazes he is given a medal before he rejoins his group. My favorite part is as he is getting on the bus with his class he is wearing his medal and so is the museum curator. Love it! I love these! Great ideas here! 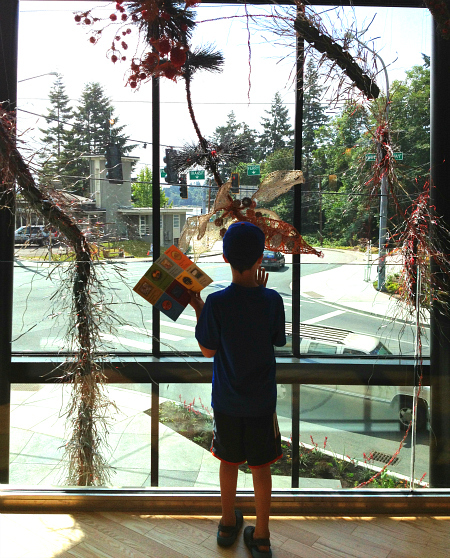 I’ve also tried a museum “scavenger hunt” with little ones. 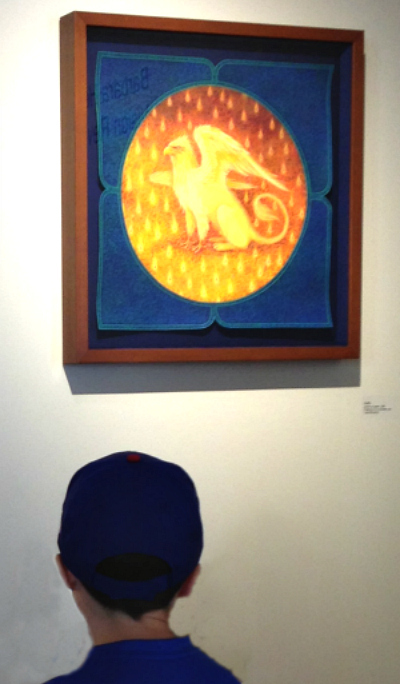 Before we get to the museum, we talk about things we might see in the artwork… A specific color, an animal, a shape. Then we make a list and check-off each one we see. It’s a fun way to build excitement before we even get there! Great ideas. 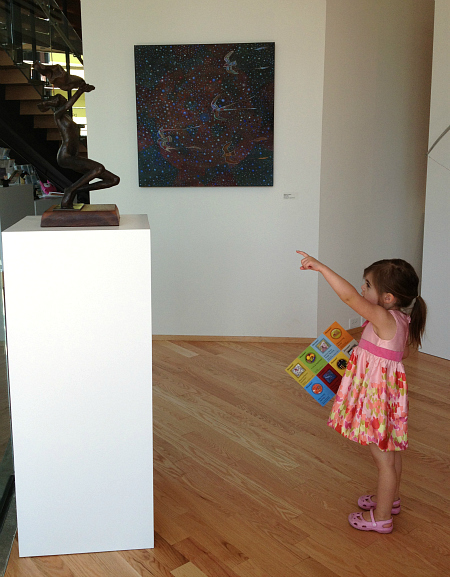 My youngest used to always set off the alarms around a particular piece of art. That was NOT my favorite game though he did not do it on purpose. Art musuems with kids used to be so stressful! I needed your games then! This is such an insightful post into what moms need! I have been planning to go back to our art museum but have been putting off thinking of ways to make it more engaging. And I always love how you always boost the usefulness of such posts with book recommendations. Thanks, Allie! These are great tips. Thanks so much for sharing them. A museum-visit book that we really liked was – Dan’s Angel: A Dectective’s Guide to the Language of Paintings by Alexander Sturgis. My 7-year-old loved it. Great ideas! We have been taking our to the museum since they were babies and the love it! The Denver art museum has make and take projects about twice a month, also storytime in galleries, and always something interactive. We are blessed to live by such a nice museum. Some of our favorite art books are the Katie series by James Mayhew and the touch the art books by Julie Appel. Love it. Playing games like this is how we get through everything. Grocery shopping, dining out, church, and museums. You cover everything- tips, games, and how to keep the learning going. 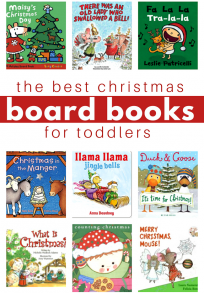 I love all of it and am pinning to K12’s Pinterest for other families to enjoy! Thank you. I would definitely try “I’ll take that one!” I feel it would give me more insight on their thought process and I can add on to their imagination. I love this! You just inspired me to plan a field trip to a local art museum this week with my kids. I’m going to try out some of these games and see how it goes! That’s awesome Katie! Let me know how it goes.